Step 2 In a large bowl, add the potatoes, grape tomatoes, and broccoli. Pour 2 tbsp extra virgin olive oil and toss. Then, add a little salt and pepper, 1 tbsp minced garlic, 1 tsp za’atar spice, 1/2 tsp coriander. Toss again so that the spices are distributed to coat the vegetables. Transfer the vegetables to a large baking sheet with a rim. Step 3 Pat salmon dry. Season with salt and pepper. Drizzle just a little extra virgin olive oil. Spread the remaining garlic evenly on top. Sprinkle the remaining za’atar and coriander. Step 4 Cut seasoned salmon into 4 equal pieces, and place on the prepared baking sheet with the vegetables. 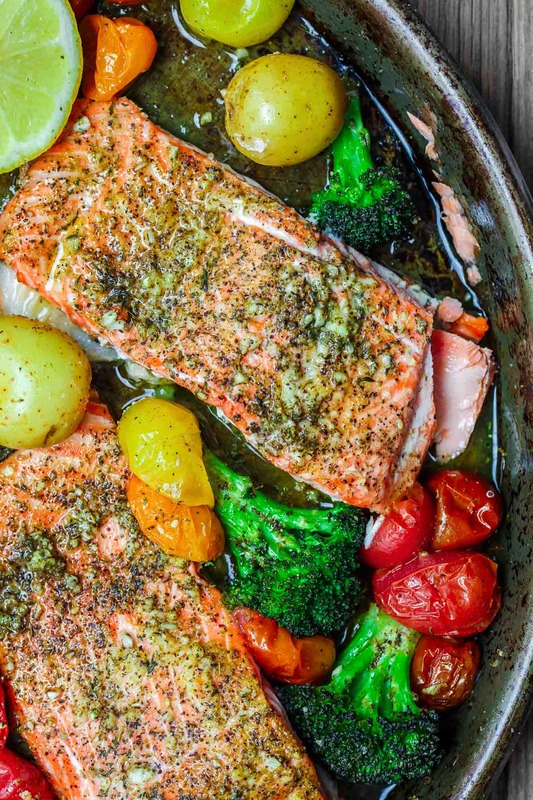 Add another generous drizzle of extra virgin olive oil over the salmon and veggies, if needed. Step 5 Bake in heated oven for 15-16 minutes. Remove from heat and squeeze lemon juice on salmon. Sprinkle more za’atar all over. Enjoy with Lebanese rice and a side of your favorite salad. (See suggestions for more sides in the post above under “what to serve with za’atar garlic salmon). This easy, flavor-packed za’atar garlic salmon recipe has been in the queue since the beginning of summer. And I’m so excited to finally share it with you!